People often put lemon in their water to give it a little bit of extra flavor. Water is served with a lemon slice at many restaurants. Drinking lemon with water is also a common approach taken during detoxification diets or as part of weight loss plans. Lemon with water contains nutrients your body needs such as vitamin C, potassium and fiber. However, this beverage may also cause side effects if you drink too much of it. Consult your doctor before drinking lemon water for medical reasons. 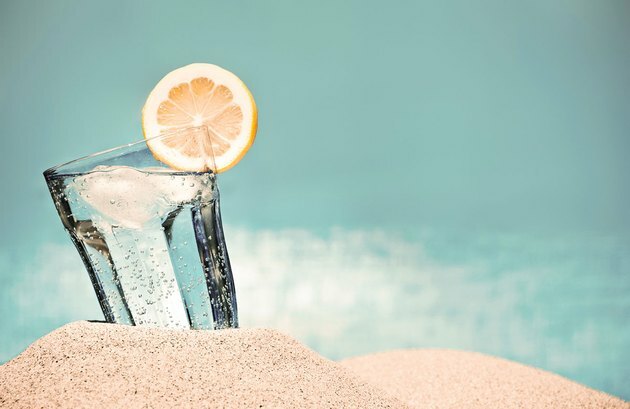 Consuming too many acidic foods or beverages, such as many glasses of lemon water per day, causes your teeth to have a constant amount of acid washing over them. This will erode tooth enamel and make your teeth extra sensitive to hot or cold foods. To protect your teeth, drink acidic beverages through a straw. If you’re already experiencing tooth erosion, consult a dentist who can recommend treatments such as bonding or sealers. Drinking too much lemon with water may trigger heartburn or make this condition worse if you’re used to experiencing it. Heartburn occurs when the esophageal sphincter, between your esophagus and stomach doesn’t function properly, and acid from your stomach moves back up into your esophagus, a process known as reflux. (Heartburn is also referred to as acid reflux.) Heartburn causes severe burning and pain in your chest. Cutting back on acidic foods and drinks helps to prevent and relieve heartburn symptoms. In rare cases, lemon water might have a diuretic effect. Lemons have a high content of vitamin C or ascorbic acid. This nutrient is well-known for its diuretic properties, which means it increases urine production in the kidneys thereby helping your body to eliminate excess fluid and sodium more quickly. While regular lemon water -- made with a moderate amount of lemon juice or by adding lemon slices to water -- loading your water up with large amounts of lemon juice might have a diuretic effect in some cases. If you start to feel dehydrated after heavy lemon water consumption, consider cutting back the amount of lemon juice you add to your drink. Don't drink lemon with water to treat any medical problem without the advice of your doctor. If you experience any side effects from drinking this beverage, stop drinking it. If side effects persist, seek medical attention as soon as possible.